Published on 25 September, 2009 in FOSS. 0 Comments Tags: foundation, intel, Linux, moblin, netbook. I almost didn’t see this, but the Moblin steering committee has just announced the final release of Moblin v2.0, as well as a preview of v2.1. There is even a builder to create your own custom Moblin version. “You can now browse and easily install new applications on your Moblin based netbook, using the Moblin Garage and Moblin Application Installer. Published on 17 September, 2009 in FOSS. 0 Comments Tags: karmic, netbook, ubuntu. If you’ve been looking for a lean, sleek, well supported operating system for your netbook then look no further. Due out next month, Karmic Koala Netbook Remix has a cleaner interface, complete hardware support and numerous other improvements. Let’s take a look. Published on 9 September, 2009 in FOSS and Tech. 0 Comments Tags: atom, dell, inspiron, Linux, netbook, ubuntu. Only just noticed that Dell is selling the Latitude 2100 10″ netbook with Ubuntu 9.04 in Australia. None of the Mini series appear to come with the option of Linux, even though my friendly Dell representative told me that they do. The Linux option is $60 cheaper than Windows XP, however it does not have the option of a built in camera. They both have the option of a touch screen, but the Linux model does not let you change the bezel, which means the configuration is broken. Perhaps this can be resolved on the phone, but the web interface presents a rather limited number of options. That’s disappointing. Still, if you like Dell and are after an atom based netbook which comes pre-installed with Linux, perhaps the 2100 is for you. Will Linux Shine as Google Chrome OS? Published on 16 July, 2009 in FOSS. 1 Comment Tags: article, chrome, Linux, mag, magazine, netbook, operating systems, ubuntu. There’s been a lot of talk about Google’s new Linux based operating system for netbooks and desktops, Chrome OS. I thought that I’d talk about it a bit too. KDE4 netbook edition on the way? Published on 17 June, 2009 in FOSS. 0 Comments Tags: kde4, Linux, netbook. I mentioned that I thought it would be a great idea to have a cut down, lightweight (if that’s possible) version of KDE4 for netbooks. I’d really like to build a super light-weight KDE4 desktop without all that extra cruft like akonadi and nepomuk. 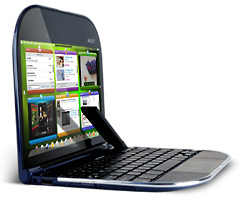 I think that would be great for a netbook to compete with Windows 7, when it comes out. Published on 4 May, 2009 in FOSS. 2 Comments Tags: atheros, canonical, jaunty, Linux, netbook, remix, ubuntu, wireless. Mike has a friend with an Acer Aspire One netbook (which he bought over 6 months ago) and it has been no end of trouble getting it to work properly. The main issue has been the horrible built-in Atheros wireless chip. There was much to-ing and fro-ing, the end result of which is that the guy wanted to buy a Windows netbook to replace it (all because of this one main issue). In fact, it’s been down right embarrassing that Linux doesn’t work. He’s wanted to give the rotten thing away, or rather, throw it away (preferably somewhere jagged with lots of rocks). Eventually we did get it working with Intrepid and even though it was clunkalicious, it did work. Until he did an upgrade that is. So Jaunty comes along and everything is supposed to work out of the box, but it doesn’t. Wireless is still broken. The device is detected, but network manager just won’t work (also iwlist wlan0 scanning does not work). I dug around on launchpad and found out, lo and behold, there is a bug that stops wireless from working. The fix? Blacklist the acer_wmi module (add blacklist acer_wmi to /etc/modprobe.d/blacklist) and reboot. Essentially the rfkill switch on the Aspire One is dodgy and it gets permanently set to off. Not loading this module prevents that, which means it’s free to be, well, on. So, if you have an Acer Aspire One with Jaunty (or other distribution) and you don’t get any wireless love, try this work around. Now I just have to get his dodgy Telstra 3G USB modem device working.. and that’s a whole other level of pain. The Just another Linux geek archives for the netbook tag.